The Buddha is an icon of joy, compassion and meditation incarnate. Emanating divine and radiant light, the Laughing Buddha is a reminder to actively make time for happiness and laughter. 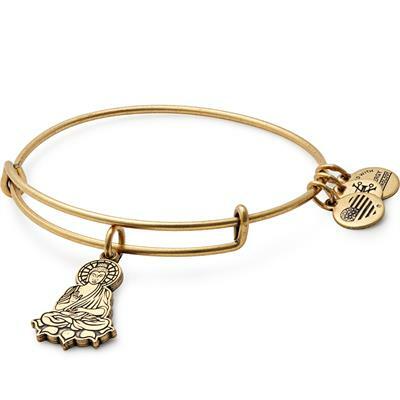 This bangle serves as a reminder to embrace happiness, and to model your life on the unbridled joy and empathy of the Laughing Buddha. Crafted in our Rafaelian Gold and Rafaelian Silver Finishes, each charm is adorned to our signature Expandable Wire Bangle. PACKAGING: This Alex and Ani bangle comes packaged in an organza pouch with its meaning card and care card. Please note that only bangles over the price of ?30 will be packaged in an Alex and Ani box.